What is the Driving Force of Plates Leading to Earthquake? In our previous post, we have discussed about plate tectonics where we have missed one term driving force to render plate movement. This theory is kinematic theory but missing, causes of plate movement that generate earthquake. The plates have size of continents and such a tremendous mass need dragging force. Now question is what the dragging force is. The most acceptable explanation of this movement is based on thermomechanical equilibrium required within earth’s material. It is obvious that density variation is occurred with temperature variation which produces an unstable condition within mantle. 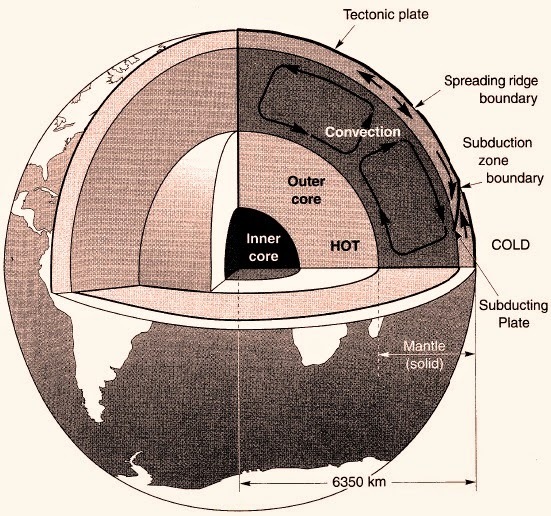 The cooler material becomes denser than relatively hot material and start to sink under gravitational force and on the other hand less denser materials (warmer material near outer core) begin to rise. The process stated above produce shear stresses beneath plates. This is the driving force we are discussing throughout this post. Dear reader we will discuss about plate boundaries and their types in conjunction with earthquake generation. Plate boundaries are very important to describe tectonics of earthquake.